Everywhere in the world, in all conditions – this has been the standard during the development of the NRC NITROX Membrane system Extreme Series. If the available space, high temperatures or insufficient current supply do not allow the installation of common NITROX Membrane systems, the Extreme Series Line is your perfect choice. The heart of this system is the specific Membrane, which is used exclusively for the NRC NITROX Membrane systemExtreme Series. To protect the membrane body, the Extreme Series has a complete second filter unit. Even in the unlikely event of a total failure of the LP compressors air conditioning system, the membrane body will be protected from oil damages. 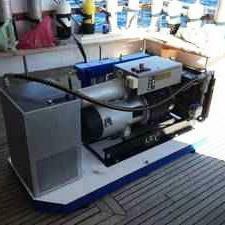 For the supply of the LP NITROX Membrane, the system has a rotary vane principle LP compressor. This compressor has especially been modified for the Extreme Series. If no sufficient current is available, the rotary vane principle LP compressor can be optionally delivered and driven by an IC-engine. Because of the compact design, the compressor perfectly fits in very narrow space. The rotary vane principle even allows the perfect operation in very high temperature. In oppsition to the PROFESSIONAL Line, the Extreme Series works with an external refrigerant dryer. Because of the modular composition, the complete membrane system can be easily adjusted to the available space. The great performance of this refrigerant droyer garantuees a constant air quality even under extreme circumstances. It also runs, if there is no sufficient current available, with an optional gettable power set. The Extreme Series is delivered ready to use, you just need to connect it. All parts are included in the system. We deliver the complete rotary screw compressor with filters, refrigerant dryer and storage tank. The complete membrane system comes with a second air preparation device, frame and security valves, as well as a special oxygen control valve and different connectors (connection to the storage tanks, NITROX Membrane and high pressure compressor).